A new game version has been deployed on tsotesting.com today. It introduces changes to the Co-op adventure loot tables, refinements to the health bar and other smaller fixes and changes. We've listened to your continued feedback and deliberated on the following: We've changed the loots of all Co-op adventures. 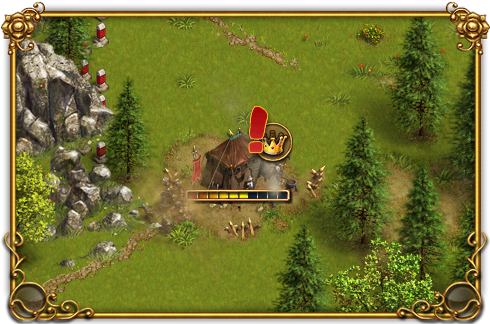 The new loots focus on rewards with higher value, such as non-producible resources in relation to the adventure's level range and also included a higher chance on rare buildings and items. Low-value resources like fish have been removed, as well as producible resources. That way we plan to strengthen the economic gameplay loop: Produce resources and invest them to obtain non-producible resources and items. The test server merchant category "Test Environment" holds "Reward boxes". These boxes provide a standard loot reward of the changed adventures as if you would have finished the correspondent adventure! You have more than enough resources, items and Gems to purchase all available items on the test server, so please play around and make sure to leave us feedback in the test server forum. For even more details our Game Design Team put an overview file together. All changes made to the coop-adventures are listed in there as well as all changes and chances on certain loot slots. Please download it from our server here. * You need a PDF reader or up-to-date browser to open the file. these are now displayed with a new icon next to the units inside. Keep in mind that balancing, functionalities and visuals may change until content from the test server hits the live servers. Last edited by BB_Saqui; 08.06.18 at 10:22. Please be aware that the PDF overview listing the changes made to the coop-adventures has been updated.